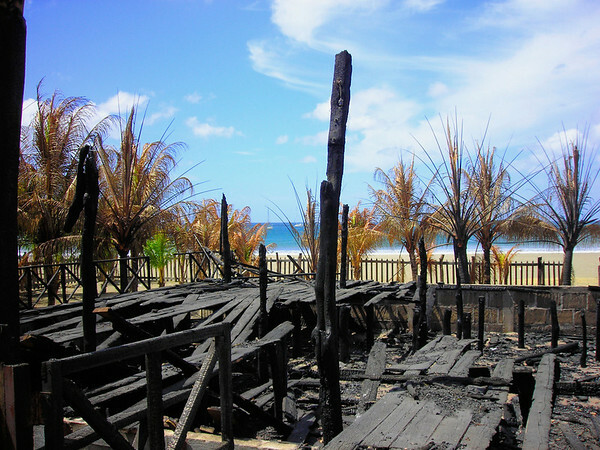 The fire we saw the first day at San Juan del Sur totally destroyed the structure but luckily no adjoining buildings. 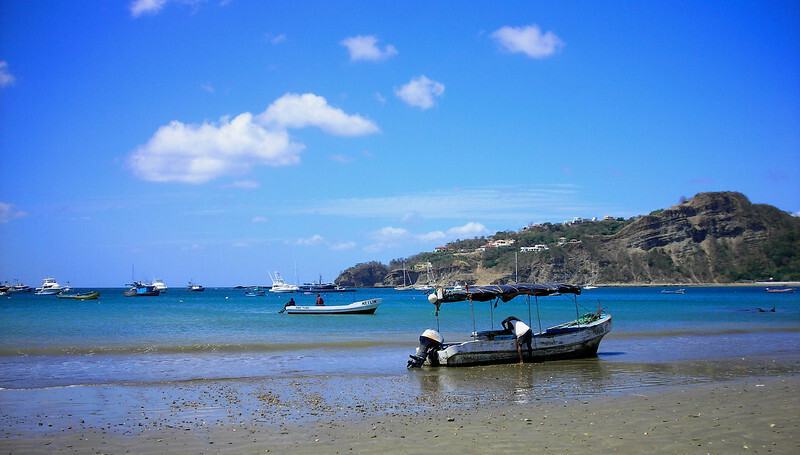 San Juan del Sur is on a 'tranquilo' and beautiful protected bay. A short distance north and south there are beaches exposed more to the open Pacific that are good for surfing. In the bay a few cruising sailboats are moored along with dozens of local fishing boats. 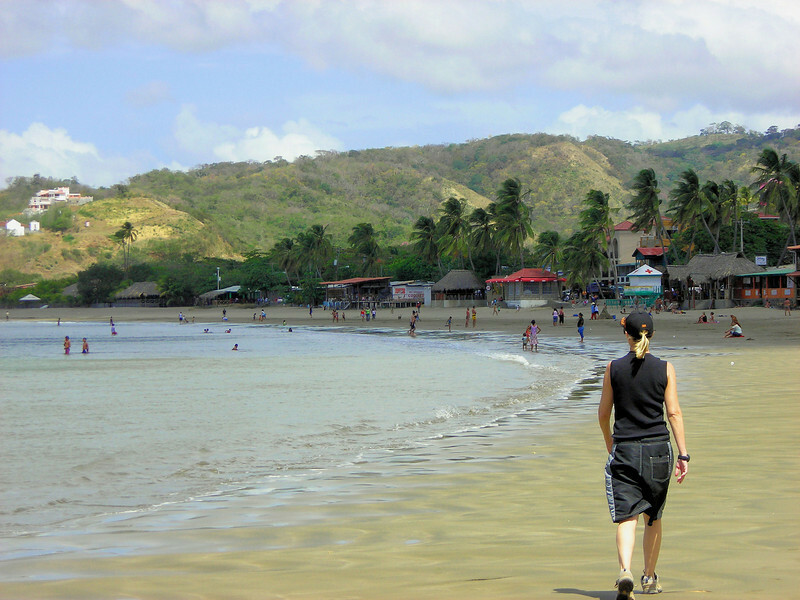 This is a good beach for walking although we were told of two second hand accounts of recent knife point robberies on beaches close to San Juan del Sur. We decide to stick close to town for our walks. The beach has several seaside bars and restaurants. 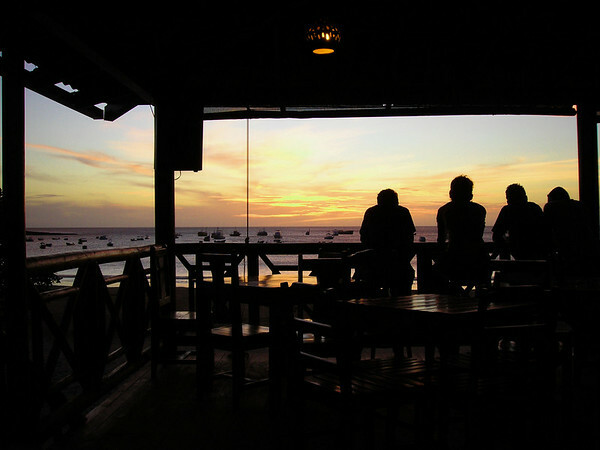 The Iguana is a hot spot for food or drink and for watching sunsets. The food here is super. 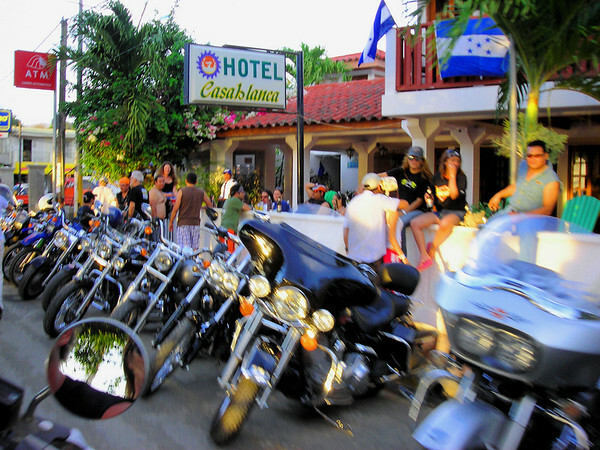 We are all set to 'take off' for Costa Rica Friday but just heard word of a Harley Davidson Motorcycle beach party happening here Saturday. We have to stay and check this out. At 4:00 PM the bikes started pulling into town. There is a large variety of motorcycle manufacturers here, 125cc and up. Driving down the Malecon people are hooted and hollered. I'm 'into this way too much. Heidi jabs me a couple times to cool it. The Malecon is lined with bikes and bikers. 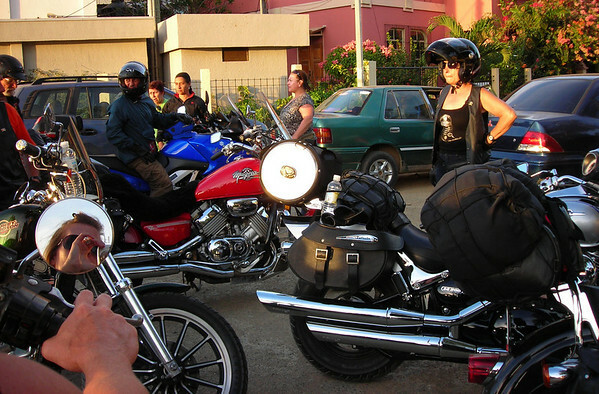 Many rode from Managua, Nicaragua where there was a party Friday night to kick off the ride. Others rode from Costa Rica. 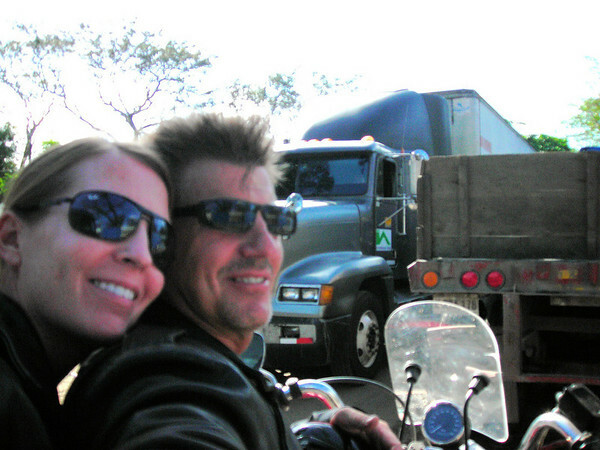 We also met a couple who rode 2-up from Canada, how cool. Chill'en at the Iguana with the couple from Canada, she just retired are both having a ball they said. They are on their way to Panama and of course tonight are talking about maybe South America. Another couple we met at our hotel just recently 'sold everything' in the states and are now just bouncing around on buses. We really enjoy chatting with other travelers. There are so many different ways to adventure travel and we love hearing about them all. The sunset is good, seeing all the bikes and talking with the bikers is good. 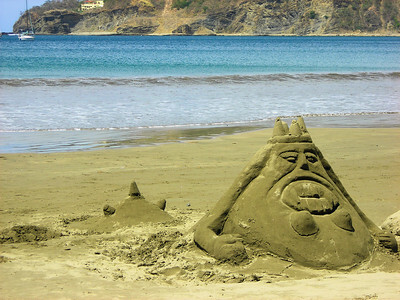 Tonight there's live music on the beach and 'Johnny Three Fingers' from Granada is playing at "Big Wave Dave's". Should be fun…..
Our hotel is only a few blocks away. We get the machine home and return on foot………. Up super early we are eager to blast out of Nicaragua and into a new country. Always 'fired up' and 'mentally pumped' before borders. We are ready. 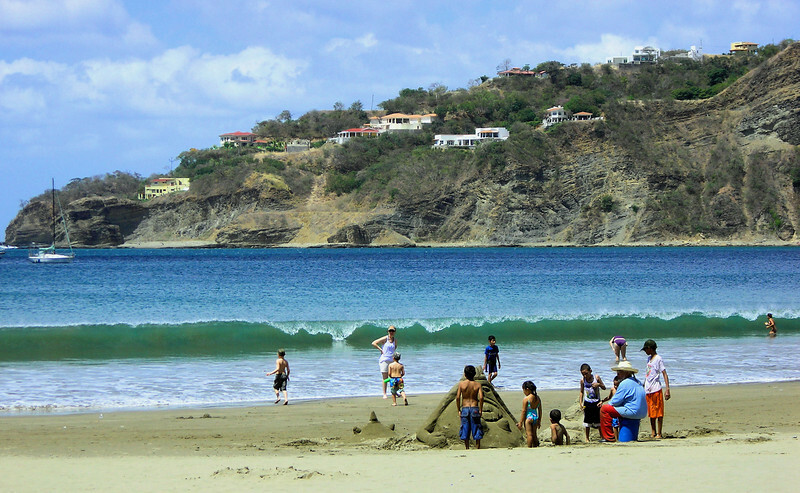 This is going to be great ---> Costa Rica……….. The border is only 30 miles away. We get there plenty early, just as planned. First, we need to get checked out of Nicaragua. We park the bike. A 'helper guy' hands me a form we both need to fill out to un-declare our passports from Nicaragua. First I get my passport stamped, $2. Next I go to the customs window and hand the clerk my motorcycle declaration papers. She gave the papers a puzzled look then immediately walks the papers over to her supervisor. The supervisor reads the entire document from top to bottom, slowly…... I'm sure this is because I didn't have the normal customs document. The document I had was an extension document made up in Managua for extending our stay in Nicaragua. After what seemed like forever he hands the papers back to the clerk who then proceeded to un-declare the bike, Nice. Heidi gets her passport stamped. 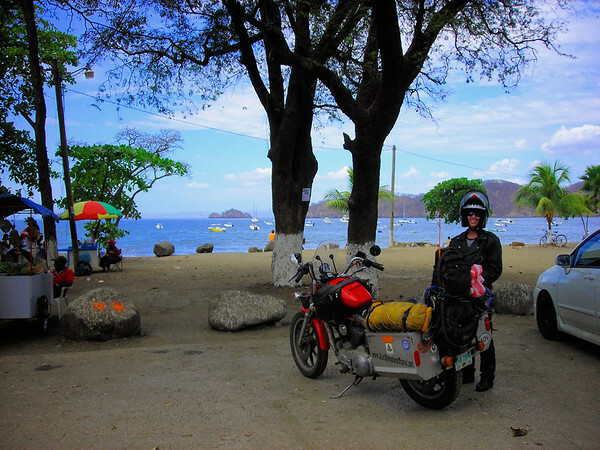 1,2,3 and we are out of Nicaragua…..
We ride about a quarter mile to the Costa Rican border. A few helpers jump in front of us as I rode right at them. They got out of the way just in time. Only one guy approached us, he had an official looking badge around his neck. I say politely "I don't want any help" He said "OK" and walked away. The first thing we need in Costa Rica is fumigation, $3.00. Another biker from Costa Rica pulls up behind us. 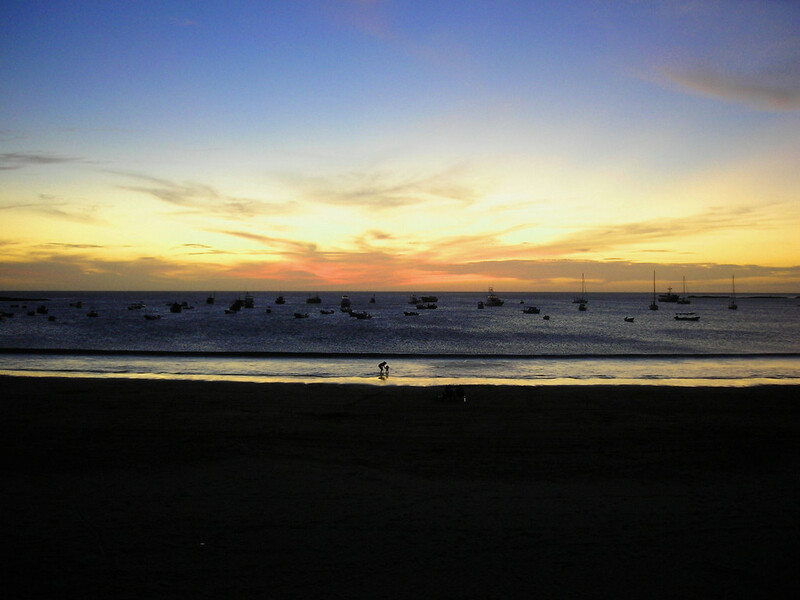 He tells us that all the hotels were booked up in San Juan del Sur so he had to stay somewhere else and missed the party. He said he didn't mind, that it was all about the ride. We ride forward and park at the first big building. I walk in. I'm at the immigration building. Inside there were several long lines of people coming into and going out of Costa Rica, two lines of people at the exit windows, one long line and one short line. I stand in the short line, get my passport stamped in less then 5 minutes. Heidi gets the info of where to go and what line to stand at and to pay $2.00' She was out 5 minutes later. Next I walk across the street to the Aduana (customs) building. There were two guys sitting behind a desk reading a paper. I ask one guy if he can help me. He looks my papers over then directs me across the street to get my insurance and a copy of my Costa Rica passport stamp. Ten minutes later I return with insurance and copies. The Aduana gives me a bunch of stamps and a small piece of paper with a stamp and tells me to ride forward 200 meters to another building. 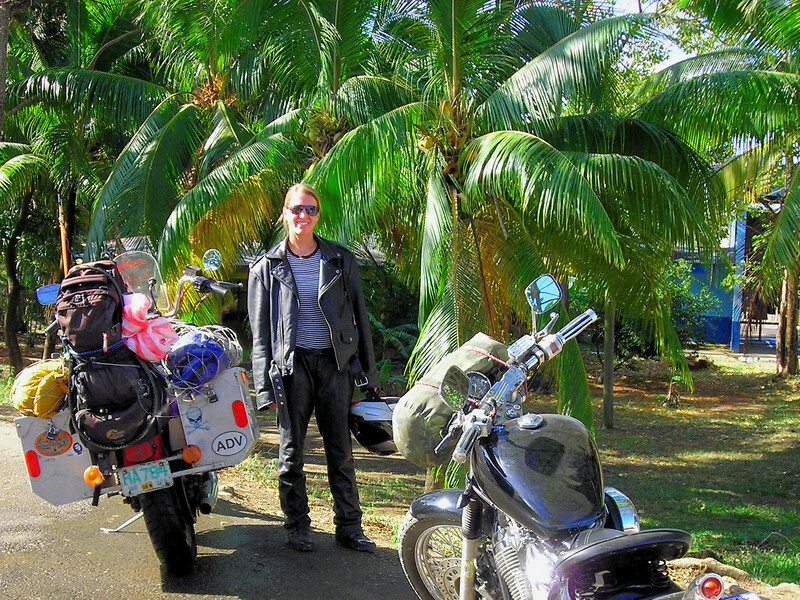 At the next building we hand over all our papers then get our motorcycle clearance document for Costa Rica. We are cleared for 90 days. I also get another small slip of paper and am told to ride forward and show it to the police at the border. That was it. The whole process took about 90 minutes with zero hassle. We Are In Costa Rica. The first city, Santa Cruz, we stop for breakfast. 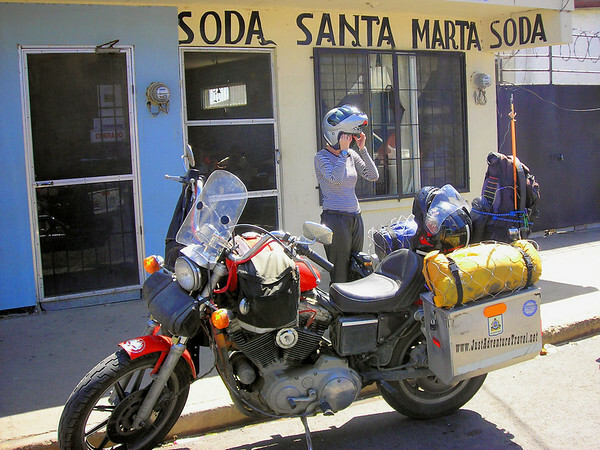 'Soda' is the name for a 'Mom and Pop restaurant' in Costa Rica. 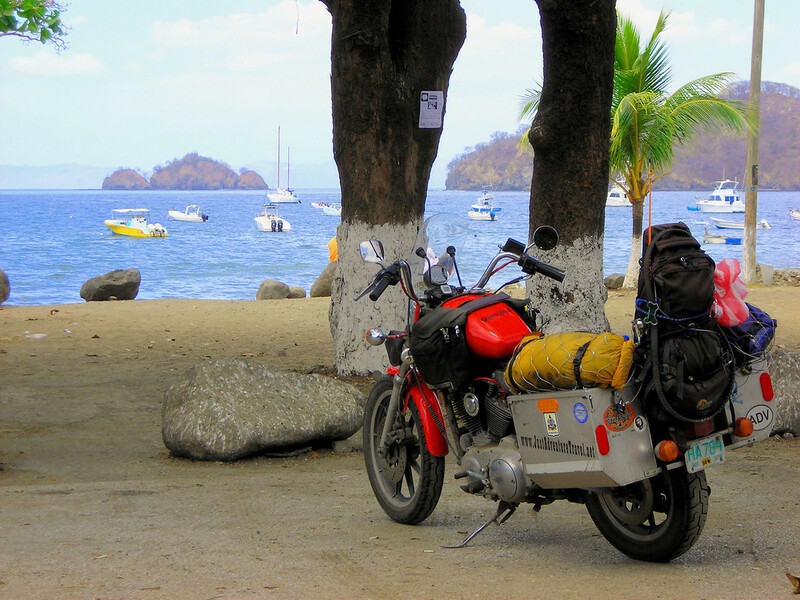 Next we ride toward a Costa Rican beach and look for an affordable place to stay with good bike security.